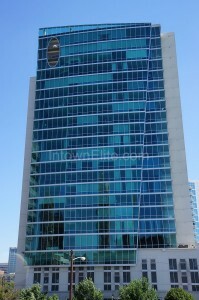 The Aqua condominium is located on the corner of 10th and West Peachtree in Midtown Atlanta. The building was completed in 2007, stands 24 stories tall and houses 84 condo units, plus a small amount of boutique ground-level retail. The condo units feature floor-to-ceiling, high-performance 1" insulating low-E windows with city views and sound control underlayment sub-flooring. The kitchens boast Viking Designer Series appliances, granite countertops, recessed and under cabinet lighting. The bathrooms feature walk-in showers with Kohler double-tile body sprayers and frameless shower doors, premium Kohler fixtures, polished marble countertops and porcelain tile floors. Aqua's amenities are more upscale than most, including access-controlled private elevators, 24-hour concierge & valet services, indoor/outdoor clubroom and a furnished resident guest suite.